In ca ipcc law exam this topic is key to pass. Its easy no concept at all just plain vanilla reading and little cramming you can easily score 20 to 25 marks. So students should see this topic as opportunity rather than obligation. Students can refer these notes for ethics and communication topic these are strictly as per icai module. 12. Provisions for filing of return of income. To develop an understanding of the basic concepts of the different types of indirect taxes and to acquire the ability to analyse the significant provisions of service tax. Guys from here you can download the IDT Excise Latest Notes by Manoj Batra really amazing with lots of graphics. The notes are really easy and important topics are covered in the notes. The Paragraphs are divided into small points to make it easy to learn. 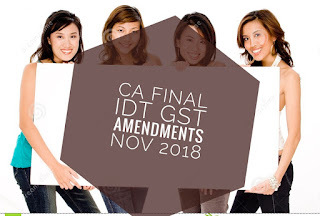 The main thing students now a days are looking for is the notes of those 53 sections of new companies act which will be applicable in IPC November 2014 Exams. Mainly company law paper will come from old companies act 1956, because there are only some changes that are made applicable from companies act 2013. Well here i am giving you IPC Law New 53 Section Notes for November 2014. These notes are made from exam point of view and are in really simple language. Our brain cannot remember useless and meaningless stuffs. (Normal human brains . Hence, the technique of converting numbers into meaningful words is important to learn. Step 2: Convert a number into words by using above letters and filling up any of vowels (a, e, i, o, u, y, h). H and Y are used as joiners because many spellings become complete by using them. Hence they are not assigned to any digit in the above table. Step 3: Connection between the section and the word created out of section number. Please remember to form a funny association and make the connection as weird as possible. Wherever possible, create a picture of your own imagination. Now take some examples of using the above technique. Ex. No. Section Number and Matter involved Creation of Word Connection of Word and the Matter under consideration How to Get what you Want in Exams. 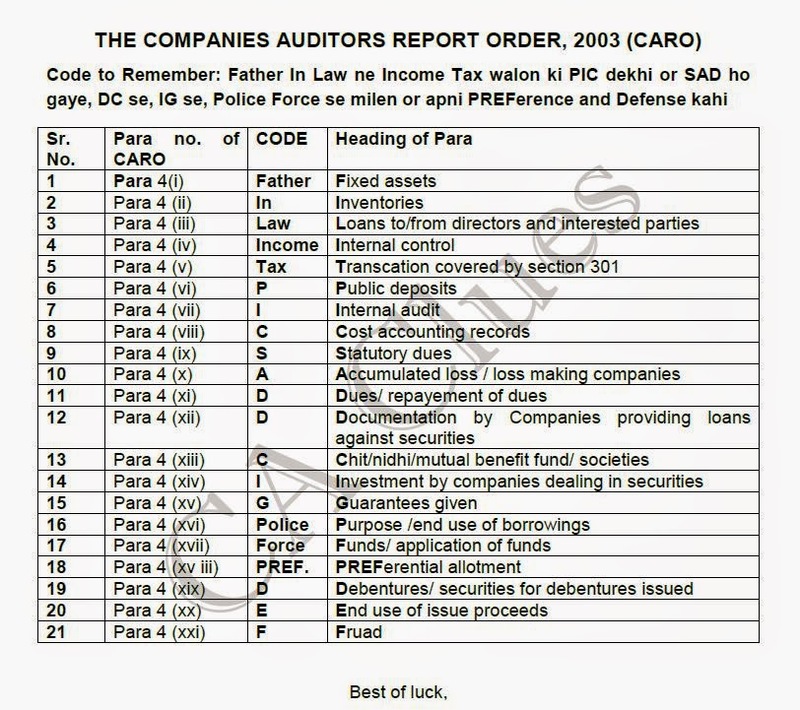 Section 185 of Companies act 2013 pertains to Provisions relating to Loans to directors. The word double has to be connected with the matter of the section, i.e. Loans to Directors. A simple association can be said as “When you give loan to director, it will result in DouBLe penalty” The moment you come across the phrase Loan to Directors under Companies Act, 2013, you will remember the word ‘Double’, the word when reconverted into digits gives you 185. You will write, as per section 185. 3 = M, W I could think of FM. Connection – Acceptance of Deposit by company they are giving advertisement in radio mirchi (which is FM Radio) The connection between deposit, radio mirchi, FM will remind you of reverse of FM i.e. 7, 3 = 73. 88 = BB or GG or BG or GB What I could think of is as follows. In register of member, company has entered names of their BBs also. (BB = Wife) The funny association of register of members, their names and their BB name connects u to the number 88. While preparing the words out of sections, please make sure that as far as possible, make a word which can be pictured. Mind remembers in pictures. That’s why you remember movies easily, while you forget the economic theories. In example no. 1 above, I gave very simple connection of giving the loans resulting in double penalty. But, the moment you start imagining in weird pictures, you are likely to remember easily. For example, if I would have said that if you give loan to Director or his related party, Shareholder comes and Slaps you on both of your cheeks. (DOUBLE SLAP). In this example, likeliness of remembering is more. Whenever you see cow on the streets, you don’t notice or don’t remember, but if some day you see a PINK color cow, you will remember the whole day or probably whole life that you had seen a PINK cow. Same is the case with the brain, it remembers the extra ordinary matter easily.